The popular static site generator written in GoLang - Hugo - has taken the community by storm. It brings all the benefits of a static site generator - 100% Flexibility, Security, Speed - but also steals the show otherwise 👉 Hugo + Jekyll Benchmarked. In fact, the Forestry.io website is built with Hugo. For this week on Frontend Friday, we’ll be covering how to get set up with Hugo on your local machine, including setting up a theme and customizing it, as well as writing your own CSS & JS. How is this different from Hugo’s Quick Start guide? 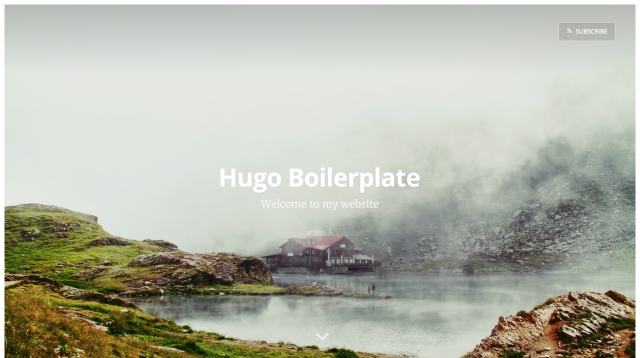 We’ll be using Hugo Boilerplate, a continuously maintained boilerplate project for Hugo sites that offers a modern developer workflow on top of Hugo. To get started, download the Hugo Boilerplate, and unzip the archive somewhere on your computer. You’ll also have to have Node.js and NPM installed, just follow the instructions on Node’s download page. 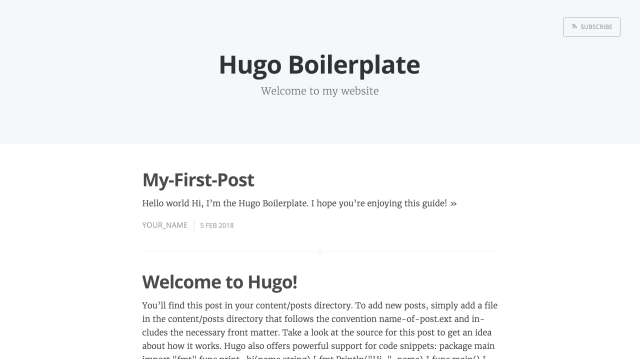 Want to get started without the Hugo Boilerplate - Check out our other guide. To get started, we’re going to add new content to the site. To do so, we’ll need to update the content to the hugo/content/ folder. To start, let’s update the example post shipped with the Hugo Boilerplate. Open up hugo/content/posts/example.md in your text editor. You’ll see title front matter field and some example markdown content. You’ll find this post in your `content/posts` directory. To add new posts, simply add a file in the `content/posts` directory that follows the convention `name-of-post.ext` and includes the necessary front matter. Take a look at the source for this post to get an idea of how it works. //=> prints 'Hi, Tom' to STDOUT. Replace YYYY-MM-DDTHH:MM:SS-00:00 with a valid date, e.g, 2018-01-01T12:42:00-00:00. If your date is in the future, Hugo wont build this post when doing production builds. Save your changes and then view the updated post in your browser at http://localhost:3000/. The date in front of your “Welcome to Hugo!” post should have changed. This will create your new post at hugo/content/posts/my-first-post.md as a markdown file. Open this file in your favorite text editor. In this file, we have Front Matter (structured metadata for the page) that can be used in your templates. Below the front matter, we can add markdown content as well. Try adding the following to the file and then save your changes. Hi, I am the *Hugo Boilerplate*. I hope you are enjoying this guide! You can view the updated post in your browser at http://localhost:3000/posts/my-first-post/. Right now your new site isn’t looking very pretty. Let’s fix that by adding a pre-built Hugo theme from the Hugo Theme Gallery, built by one of Hugo’s great community contributors. 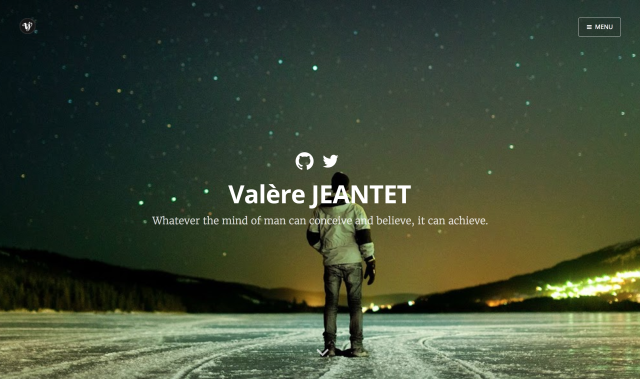 We’re going to use the Casper theme by @vjeantet. We’ll do this by adding the theme to the hugo/themes/ directory, specifically hugo/themes/hugo-theme-casper/. You’ll have to add these inside your hugo/ directory. Download the theme, unzip the archive and then copy the entire contents to hugo/themes/hugo-theme-casper/. Next, you’ll need to update your site’s configuration with any of the theme-specific configurations. copyright = "All rights reserved - 2018"
description = "Welcome to my website"
metadescription = "Used as 'description' meta tag for both home and index pages. If not set, 'description' will be used instead"
authorlocation = "Earth, Milky Way Galaxy"
For a full list of available configuration docs, see the theme documentation. Now head back over to the browser and check out your updated site! Now that we’ve set up a basic working site with a theme, you’ll probably want to personalize it. Next, we’ll update the default hero image to something else. Open up hugo/config.toml and find \[params\]. Below, find the parameter cover and update it to /img/darius-soodmand-116253.jpg, and save your changes. Now head back to your browser to see your updated site. It won’t look exactly like the screenshot above but don’t worry we’ll get there. 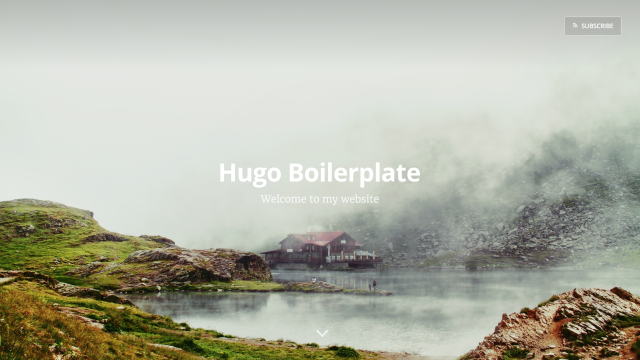 Now that you’ve customized your site to be a little more personalized, we’ll focus on the most powerful aspect of Hugo and this boilerplate: powerful yet simple templating. Earlier we added the Casper theme to the site, which allows Hugo to use all of the HTML layouts stored at hugo/themes/hugo-theme-casper/layouts/ to generate your site. Now, we’ll extend the theme by using Hugo’s template inheritance. Any layouts stored in hugo/layouts/ will override any layout with the same name in theme’s layouts directory, allowing us to customize our site without messing with the theme. Along with Hugo, this boilerplate comes with a development server that automatically post-processes CSS & JS for the browser. Any CSS, JS, or images found in the src/ folder will be processed and automatically moved to hugo/static/. Let’s add these to your theme so that you can customize it as needed. We’ll copy the base layout of the theme and add the boilerplate’s custom CSS and JS files to the layout. Now all of your custom CSS and JS will be used on the site. Head back over to your browser to see the final result! Now you’re all set to begin building your static site with Hugo! Feel free to continue using the Casper theme, or start from scratch using the hugo/layouts/ directory. Check out the example files in the Boilerplate repository if you choose to start from scratch. Next week we’ll be releasing a post on setting up version control with Git to facilitate continuous integration and continuous deployment to various hosting providers using Forestry, the CMS for static sites built with Hugo and Jekyll. Last week: We looked at integrating a performant search into your static site: Static search with Hugo + Algolia .